Fluffy, scruffy, bouncy, and full of joy, dogs are and always will be man’s best friend. They do not, however, come with warning labels or instruction manuals. Every breed of dog comes with teeth and paws and they all naturally know how to use them. They do not always intend to be harmful. Take puppies for example who just want to play; they sometimes accidentally injure those they are trying to jump with and climb on. Leave dogs alone that are sleeping, resting, injured, very old, or with puppies. Also, give them lots of space so they feel comfortable. A safe dog is one that has a soft, relaxed, happy face and a wiggly body. Look at the dog’s body, face, and tail. Always walk away from dogs who cannot follow you. Never approach a dog that is on a bed or furniture. Do not bother dogs in cars or behind fences. Leave chained dogs alone. They may be protective of their space or their family and worried that you are an intruder. Keep dogs and kids separated during meal times. It’s also important to teach your young ones the safest ways to interact with your pets. Here are some tips for the kids. Teach kids how to safely deliver treats to their pets. Give the food from an open hand. 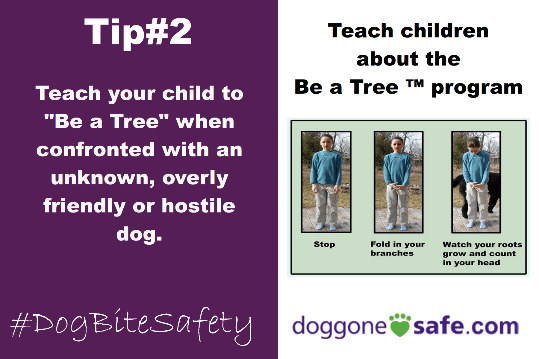 Teach your child to “be a tree” when confronted with an unknown, overly friendly or hostile dog. 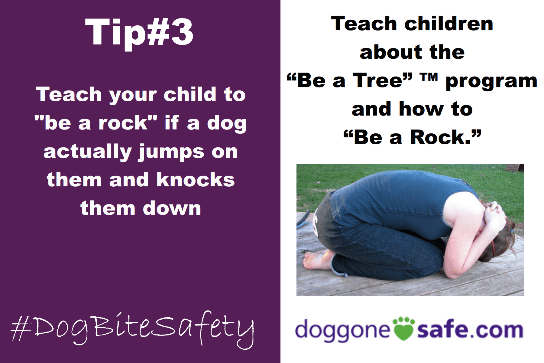 Teach your child to “be a rock” if a dog jumps on them and knocks them down. Teach children to play safe games such as fetch instead of running and jumping games. Teach kids to pet a dog correctly. Show them how to notice when the dog wants to walk away. With proper training all around, we can continue to coexist safely and happily with our furry friends. Safety is always going to be priority number one, but caring for our companions is a close second. Owning a pet is a pretty great experience that you should want to share with friends and family. The last thing you should have to worry about it whether or not Fido is going to nip at Nana. Take the proper steps to avoid any issues ahead of time and you’ll be raising a courteous canine in no time. When Stephanie isn’t at work she’s trying new things from food, tech, games, hair colors, etc. 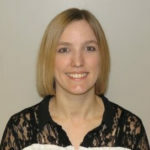 Stephanie and her husband of 2 years live with their 2 boys, 1 fostered cousin, 2 dogs, 1 snake, and 1 fostered bearded dragon. Her goals are to experience the best life has to offer. They like to explore as a family everything from the outdoors, new towns, new games, or even new concepts or ideas for the house.